Dull fruit bowls belong in model homes with fake plastic apples. Your home needs something fresh and exciting like Vicky. 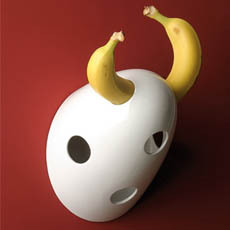 Vicky, a handmade porcelain banana holder, hangs on the wall and holds bananas in a way that makes them look like deer antlers or bull horns—an amusingly ironic design, especially for vegetarians and non-hunters. Just place your bananas in it to ripen and watch your guests go for bananas while your bowl of apples goes completely unnoticed. 1) Unless you’re a primate, you shouldn’t have bananas hanging from your wall. 2) When empty, ‘Vicky’ would highly resemble an athletic cup. Not cool. 3) $190 is more than enough money to buy an entire year’s worth of bananas. 4) This is the most overpriced piece of crap that I’ve ever laid my eyes on.